Foodbanks have come a long way since the first one opened in 2000. Designed to help people combat short term hunger in times of crisis, they now help a huge range of people on a daily basis. With 13 million people living below the poverty line in the UK alone, the amount of people turning to foodbanks is on the increase as more and more families find themselves suffering for all sorts of reasons, from redundancy to receiving an unexpected bill on a low income. But with recent controversial headlines, like claims that food is being given to people who aren’t in genuine need and stories of claimants forced to hand back food that needs cooking because they can’t afford electricity, the amount of good work they do is often getting overlooked. But who are the people behind all the facts, figures and statistics? 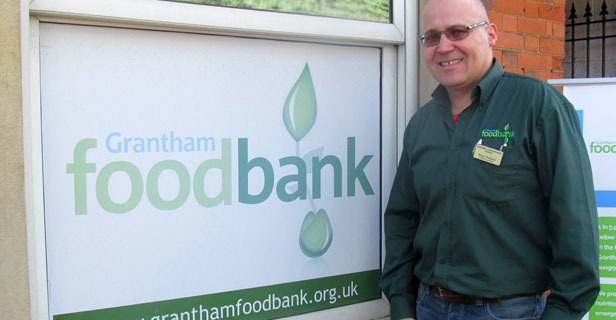 Foodbank co-ordinator Brian Hanbury has managed the foodbank in Grantham, Lincolnshire since it opened in 2011. It now has 115 volunteers. Based in an old Victorian house, every room is crammed full with tinned goods, long life milk, pasta, cereals and even pet food. Another room contains household goods including toiletries, baby clothes, hot water bottles and duvets. Vouchers are handed out to a number of supporting organisations including job centres, citizen advice bureaus, the police and doctors. It is then their responsibility to distribute them to people in genuine need. When somebody arrives at the foodbank, they’re greeted by a team of volunteers who offer them a friendly ear, but who will also talk to them to assess their situation. The foodbank opens for two hours on a Monday, Wednesday and Friday afternoon. Volunteers often turn up early to help prepare the bags. Each bag is designed by a nutritionist and contains enough food and basic supplies for three days. Now in its third year, the volunteers are used to seeing a constant stream of new faces walk through the doors each week. However they do ask that each claimant writes a few comments in a book to encourage them to give thanks. It is in this book that the true extent of someone’s need becomes apparent as they often use it to open up about their lives. One woman had been washing her children’s hair with washing up liquid until the foodbank gave her some toiletries. She used them to bath her children that night and then had a bath herself. When she went to bed that night, it was the first time she had felt human again. In another case, a supporting agency couldn’t understand why a woman was suffering from malnutrition. It turned out that she owned three cats and had been giving everything of nutritional value to them and leaving nothing for herself. On hearing this, Brian decided to expand the foodbank to include pet food as well. It’s not just day to day needs that are catered for. “People always donate toys at Christmas time and there’s an influx of chocolate eggs at Easter time. This kind of organisation ignites passion among the local community,” said Brian. Away from all the headlines, the foodbank has proved itself as a vital part in any community. They help to revive hope and restore dignity in people who have often had it broken. “We are not giving them a hand out, we are giving them a hand up,” added Brian.